It wasn’t too long ago that our family subscribed to the Des Moines Register. We enjoyed the local news for Polk County and surrounding areas. It kept us in touch with our community and what was going on around us. The only problem was that the newspapers would build up. If you didn’t read the paper for a day or two, they would start to accumulate. If you were gone on a trip, you were probably going to face a pile of papers on your front step if you didn’t have a friend grabbing them for you (yes, you can sure tell your deliveryperson to stop putting them there for a week, but that doesn’t mean it will happen). Sometimes, emergency trips would happen and you’d come back to find a bunch of papers on the doorstep. Not only would this amount to a lot of clutter, it would also be a sure sign that no one is home if a home intruder is casing the neighborhood. 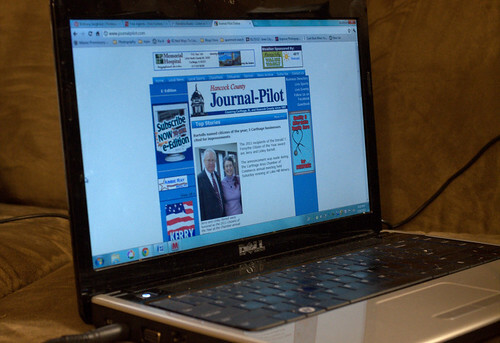 We still wanted our local news, though, so over time we migrated to simply reading desmoinesregister.com. It’s actually one of the default pages that opens in my web browser. On an average visit, which happens a few times a day, I visit 10 or so pages on the site, each of which has several ads on it. I’m pretty sure that they earn more revenue (and more profit) in a day from me visiting their site than they ever earned from me buying printed copies of the paper. Yes, we’re not paying for the paper at this point, but the cost of paying for the paper would largely cover the cost of delivery and the cost of the actual printing and materials related to that. Online, there is very little of that cost. I am very interested in supporting local news. I want to know what’s happening in my community and I get a lot of value out of that knowledge, from free local events to the politics of the local community. However, the drawbacks of getting a daily newspaper on my doorstep – the clutter, the cost, and the potential for making others aware we’re not around – add up to enough that I’m much happier being a frequent reader of online sources for local news. Such sources continue to get revenue through online advertisements and don’t have the physical costs of the newspaper itself or the delivery mechanisms. The newspaper business is going through a challenging time right now. They’re still transitioning from the model they’ve used for hundreds of years – selling papers by delivery and newsstands – to a model that, at the very least, embraces online sales. Revenues are declining, but according to the study linked above, most newspapers aren’t yet bothering to sell targeted online advertisement. In other words, because they’ve not fully committed to an online business model yet, many newspapers are leaving a lot of advertising money on the table. As a reader of newspapers, I want them to thrive online, and I’ve seen from the business models of many websites that news can thrive online. As more and more people switch to reading news online, they’ll follow their readers. Like any transition, it takes time and a willingness to try new things. They’ll get there. From my perspective, the best thing I can do is support my local newspaper online by reading it, which I do anyway because I get value from the information there. The drawbacks of a printed paper – the clutter, the waste, the sign of a person on vacation – are enough to get me to switch away from it. The savings in terms of cost is just icing on the cake.